“We defy translation,” Sandra María Esteves writes. “Nameless/we are a whole culture/once removed.” She is half Dominican, half Puerto Rican, with indigenous and African blood, born in the Bronx. Like so many of the contributors, she is a blend of cultures, histories and languages. Editor and scholar Melissa Castillo-Garsow writes in her introduction that “the experiences and poetic expression of Afro-Latinidad were so diverse” that she could not begin to categorize it. Some write in English, others in Spanish. They are Puerto Rican, Dominican and almost every combination conceivable, including Afro-Mexican. Containing the work of well-known writers such as Pedro Pietri, Miguel Piñero and E. Ethelbert Miller, less well-known ones are ready to be discovered in these pages. 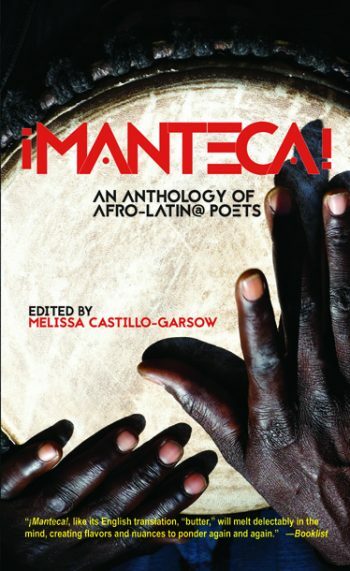 Click here to listen to an interview with Melissa Castillo-Garsow about her edited anthology, ¡Manteca! An Anthology of Afro-Latin@ Poets. MELISSA CASTILLO-GARSOW, a Mexican-American writer, journalist and scholar, is the author of a novel, Pure Bronx (Augustus Publishing, 2013), a poetry collection, Coatlicue Eats the Apple (VerseSeven, 2016), and the co-editor of La Verdad: An International Dialogue on Hip Hop Latinidades (Ohio State University Press, 2016). Her short stories, poetry and articles have appeared in numerous journals, including The Acentos Review, Hispanic Culture Review and El Diario/La Prensa. In addition to serving as managing editor of Words Beats and Life: A Global Journal of Hip-Hop Culture, Castillo-Garsow is completing her Ph.D. in American Studies and African American Studies at Yale University.